Commemorating Boru: What did the Battle of Clontarf mean in 1914? (Audio) | Come Here To Me! « ‘Still Fighting Fire With Fire’ – Joseph Connolly of the Irish Citizen Army. In recent weeks I’ve been doing some research on how Irish nationalists and the city of Dublin commemorated the Battle of Clontarf in 1914. I had an article on this subject in the History Ireland special on Clontarf and a recent Irish Times supplement. The History Ireland special is still available in shops. Last night this audio piece narrated by me aired on The History Show, hopefully some of you will enjoy it. The piece today is a sort of mixmatch of the two previously published articles. While the millennium of the Battle of Clontarf has captured the public imagination, previous milestone anniversaries of the iconic moment have likewise had an impact on the populace. In 1914 Irish nationalists organised commemorative events around the theme of Clontarf, and attempted to politicise the historic event in the pages of publications like the Irish Volunteer. Against a backdrop of political uncertainty regarding Home Rule, and with armed volunteers once more appearing on Irish streets, the battle was presented as a definitive victory for a native Irish force over a foreign aggressor. The Irish Volunteer newspaper and Clontarf. Says the Shan Von Vocht. 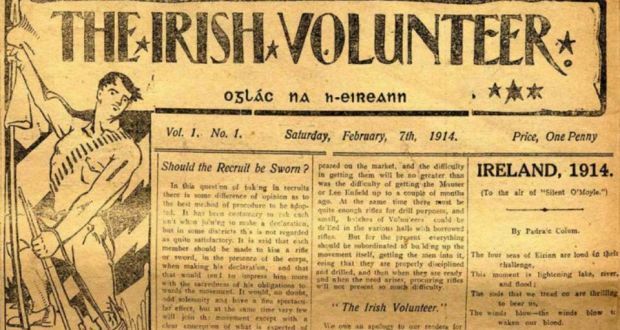 The inaugural issue of the Irish Volunteer newspaper, February 1914. Corps throughout the country are eagerly awaiting orders for the big event, and are holding themselves in readiness to send contingents for the fitting celebration of a great National victory. And undoubtedly a Volunteer review will be a fitting and a worthy celebration of Ireland’s victory over the Dane. I think it is my duty to protest such an unwise step. We are not out for a star turn. We know some drill, but we are weaponless… It will be mainly a splash of mud oratory by speakers whom Brian would not understand and who know little of him and his times, nor of the events which led up to the great battle. The Viking stock on Irish ground. Has grown and strongly still shall grow. Commemorations of Clontarf and Brian Boru. Never since the days of Brian Boru has world famed Kincora -the birth-place of Ireland’s greatest king—come so prominently forward as it did on Sunday last, when thousands of Irishmen of all political and religious beliefs assembled to honour the name of Brian Boru ; for was it not he who drove the Danes back at the Battle of Clontarf, and who relieved Ireland to a certain extent of the thraldom of the Scandinavian. 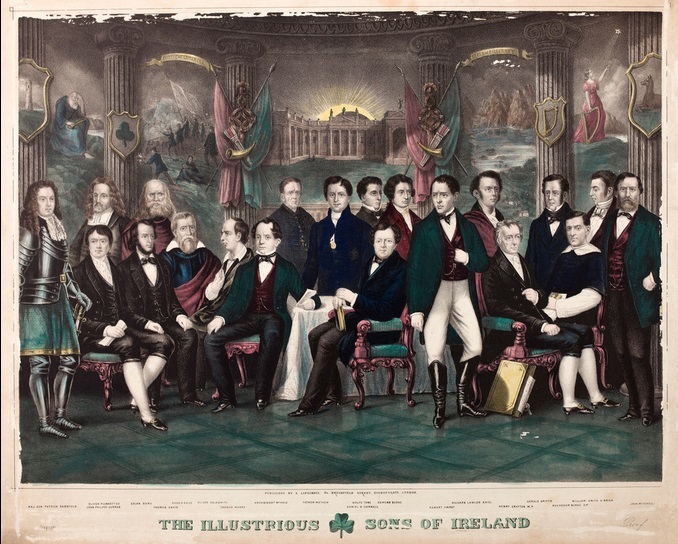 The absence of a central, public commemoration was noted by some commentators, and it was not until May that it was reported Dublin Corporation had invited County Councils and other public bodies to discuss commemorating the anniversary. A writer in the Ulster Herald bemoaned the fact that ‘few throughout the length and breadth of the land’ had marked the anniversary, but did praise the ‘bright, burning fires’ lit in some of the hills of Donegal in honour of Clontarf. The Abbey Theatre in Dublin marked the anniversary with a revival of ‘Kincora’ by Lady Gregory, which was generally well received by the media. 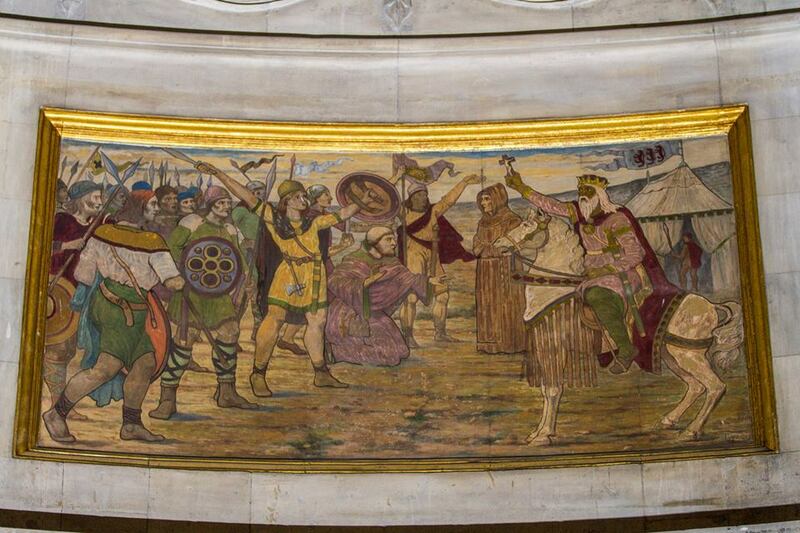 The murals of Dublin City Hall. 1914 saw the beginning of the painting of the murals depicting the history of the city within the rotunda of Dublin’s City Hall, the work of students of the Metropolitan School of Art, under the guidance of James Ward. Alderman Thomas Kelly, leader of Sinn Féin at Corporation level, had been instrumental in this process, suggesting the subject matter. Ward and his team of students proposed a series of murals depicting events including the arrival of the Norse, the Battle of Clontarf and the coming of Saint Patrick. There is a clear nationalistic bent to the works, and as Philip McEvansoneya has noted, there are three strong emerging themes: ‘Dublin legends and history, Irish Christianity and the historic struggle for Irish independence.’ While the mural of Boru and Clontarf was not painted until later, in a process that took until 1919 to complete, the arrival of the Norse was one of the murals commenced in 1914. The sight of the native Irish, preparing to fight off this approaching alien influence, is no doubt influenced by the discourse at the time. 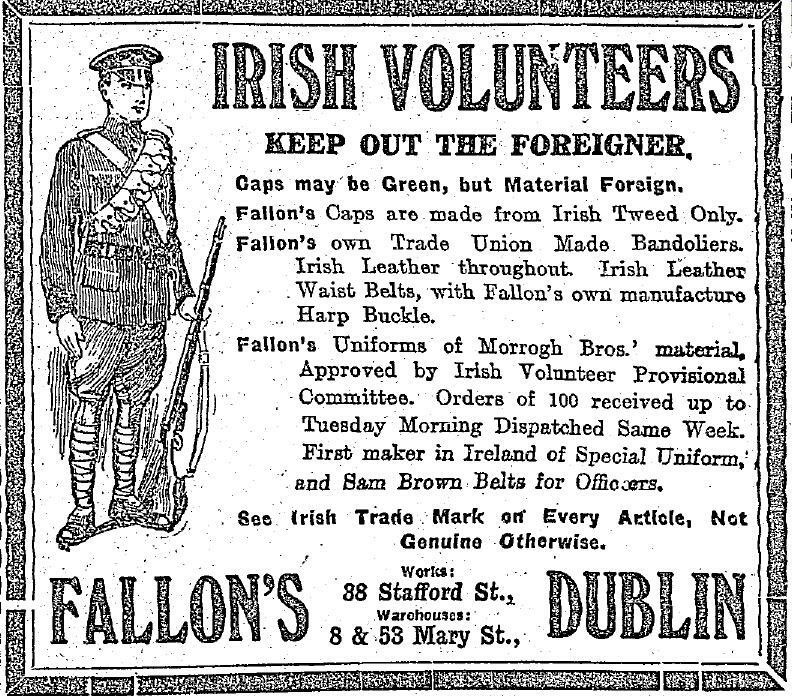 ‘Keep Out The Foreigner!’ – a contemporary advertisement for a supplier of Irish Volunteer uniforms. Boru’s memory was often evoked by the Volunteers, who even named their Ennis Corps after him. Clontarf and Boru continued to play an important role in the nationalist narrative and the ideology of Irish separatism after 1914. Seamus Daly, a member of the Irish Volunteers, recalled Thomas McDonagh addressing him and others on Holy Thursday 1916 in his statement to the Bureau of Military History, remembering preparing weapons at Clontarf for the insurrection ahead. McDonagh ‘reminded us we were standing on historic ground in Clontarf where Brian Boru had defeated the Danes in 1014. Easter was the time of the battle of Clontarf. The battle was on Good Friday. Good Friday and Easter were coming near, and that was the time of resurgence in Ireland.’ No doubt McDonagh, Daly and others firmly believed Clontarf to be a part of their nationalist heritage. Admiration wasn’t restricted to nationalists. A year after the anniversary, in 1915, The Irish Times reported a recruitment sergeant with the Royal Inniskilling Fusiliers telling a crowd at Dún Laoghaire – then Kingstown – that he was a Clontarf man, like Brian, and that “he thought Boru would have made a splendid recruiting officer, and he wished they had him today”. Very interesting, I was born in Clontarf, but many years after the ‘Battle of Clontarf.’ Also I would love someone to give a commentry of my cousin George Gilmore nothing is ever said about him.Please give a commentry about him.I only met him when I was very very young so don’t really remember him. Thanks Heather! A historian named Brian Hanley wrote a great piece on George in Lookleft magazine, it might be online, if not we can ask Brian to email it to you. Was George with Brian Boru at the battle?